Michael Winterbottom’s The Trip (2010) showcases the flexibility of food as an organizational feature of movies. A requisite part of the film (and television show from which it is distilled) is the recognition by Rob Brydon—a comedian and television personality who plays a heightened version of himself, and who acts something like the Boswell or Sancho Panza to Steve Coogan’s heightened version of Steve Coogan—that Coogan has been entrusted the job of writing a series of restaurant reviews despite the fact that he isn’t much of a gourmand. During their first meal together, it becomes clear that Coogan was planning to rely on his foodie girlfriend (Margo Stilley’s Mischa, physically absent for the duration of the journey because she took a job in America, and is clearly on the outs with Coogan) for writing advice. With a limited food vocabulary in place, and no gustatory credentials save being rich, Coogan mostly limits his comments to “nice” and “quite good” throughout their travels. One wonders what his eventual write-ups will look like! So if the film really isn’t about food, then what does it offer? What happens when two of the screen’s most committed “frenemies” spend several days together? The best I can muster is that The Trip isn’t quite a mockumentary, it isn’t quite a travelogue, it isn’t totally tragic, and it isn’t the purest and sunniest of comedies. Coogan’s tour of gourmet restaurants of the North of England and his decision to bring Rob Brydon along as a travel partner is a confidently intertextual and reservedly postmodern unraveling of celebrity, exposing as it does the difference between public swagger and private insecurity. 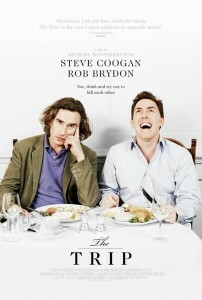 Each meal is a pretext for mental sparring between Coogan and Brydon. They find themselves discussing their changed circumstances in aging (these are the most heartfelt of their encounters), though they mostly compare their careers and offer contrasting celebrity impersonations. During their first meal, Brydon and Coogan compete over who does the best Michael Caine. Brydon’s version narrates Caine’s aged voice, while Coogan discusses the inflection and deliberateness of Caine’s readings. Probably the best of these celebrity riffs doesn’t even come during a competition. While singing Abba together in the bar before a meal, Brydon moves from singing to sounding like the Swedish chef from The Muppets, all the way clear to approximating Christoph Waltz’s Col. Hans Landa (who, incidentally, Brydon looks a bit like). The assured transition is astounding to watch. Even if The Trip were nothing but these moments, it would still have a devoted following. But The Trip is so much more than celebrity impersonations. It is also one of the few British productions of recent years to freely mix realist and surrealist modes without overly relying on either. Some of the greatest set pieces takes us into Coogan’s anxiety-filled dreams. He is chastised by a fan for his association with Alan Partridge. He encounters Ben Stiller poolside at a Hollywood mansion, where his dreams of working with the best and brightest American directors disappear before his eyes. In the realm of the waking, he smokes weed and explores his association to Samuel Taylor Coleridge, whose Dove Cottage the who had just visited (what would Coleridge have made of spliffs??). But the most surreal conceit of the film is normalized into the very premise. Coogan and Brydon make a trip to some of the remotest and most rural parts of the North of England, yet they aren’t doing so in search of history or the natural wonders of the land (though those things certainly are there). Rather, they are going around Heritage England in search of the finest and hippest Continental dining opportunities. When they have a traditional English breakfast, they comment on it. Otherwise, the film showcases the invasion of pigeon, scallops, and microgreens over mince pie, blood pudding, and beans. Coogan and Brydon’s Deep England is not a total throwback. They admire the beauty and find some of the tradition, but much of the film showcases the struggle to find cell phone service amidst the dales, glens, hills, and fields. The Trip assuredly relates to outside cultural forms, but recognizing them is not essential to enjoying the proceedings. Giles Harvey has written about how densely packed things get, and how the assured intertextuality signals The Trip’s greatness. The Coogan/Coleridge comparison is admirably handled—Coogan flees his past, finds the present unbearable, must cope with (soft) drugs and the solace of women, is touched by greatness but a bit nerve-y for true ascension—and the decision to have Brydon read directly from William Hazlitt’s profile from Spirit of the Age (1825) adds to Brydon’s characterization as a chronicler and critic. In fact, while he is the Boswell to Coogan’s Johnson, he is also the Hazlitt to Coogan’s Lake Poet. If Coogan were lazier or more whacked out, he would be De Quincey, but as it stands, his hardscrabble attempt at balancing his (imagined) personal troubles and career suggests a late Coleridge. I want to think of this film as something like William Cobbett’s Rural Rides (1830) meets Bunuel’s Discreet Charm of the Bourgeoisie (1972). It is a film about discovery of place and the scrutiny that meals bring to character and habit. The end recalls the heartrending final scene from Bill Forsyth’s Local Hero (1983). In that film, and American executive goes on a business trip to rural Scotland and falls in love with what he sees. The film ends with his arrival back in Houston, at his loud urban apartment. He has to go out onto the balcony and tries to recover the memories of the trip he was just on. In The Trip, Coogan arrives back at his austere and eminently tasteful central London flat. Brydon has been dropped off to the hearth and home of his family, all coziness and warmth. Coogan, by contrast, is in a dark, lonely place. He is divorced, his son lives with his ex-wife, his girlfriend has essentially left him, and he has tested the boundaries of Brydon’s tolerance (though, to be fair, Brydon has done the same). All that remains are memories of a trip. The Trip currently streams on Netflix (the film version) and on Amazon Prime (the TV series). I agree with critic Ken Hanke in claiming that the film is probably a more rewarding experience. In addition to offering a faster succession of laughs, it admirably condenses the travelogue aspect. However, since one of the stars of the film is the scenery, interested parties are encouraged to watch the proceedings in full. Although not a part of our Food & Feast screening series, The Trip represents one of the best of recent (filmic) attempts at using food for thematic and narrative purposes.